Alexander McQueen is famous for it's theatrical and often controversial designs, and is one of my all time favourite fashion houses. Started by Lee Alexander McQueen in 1992, he won four British Designer of The Year Awards, as well as being awarded a CBE. Sadly in McQueen committed suicide in 2010, and was succeeded by the current creative director Sarah Burton. OH MY GOD. I'm not sure how I can put into words how much I love these designs, but I will try to. One of the first things I am obsessed with is the colour palette (which I'm sure you wouldn't expect from a girl who lives in pastels) as it's so rich and dark and the silhouette of the high neckline. The two looks on the right use leather to create a strong powerful look, with the first using a heavy leather jacket and the second more subtly using a cinched belt to add toughness to the look. The two dresses on the left are just perfection, I would wear them both in a heartbeat. I love the mystery and gothic feel they have, with the patterns moulding perfectly around the body giving the appearance of being delicate but strong at the same time. "I create clothes for women who are not only fiercely fashionable but also own their power and femininity. But the heart of my collection will always be the craftsmanship; everything starts from my obsession for details." 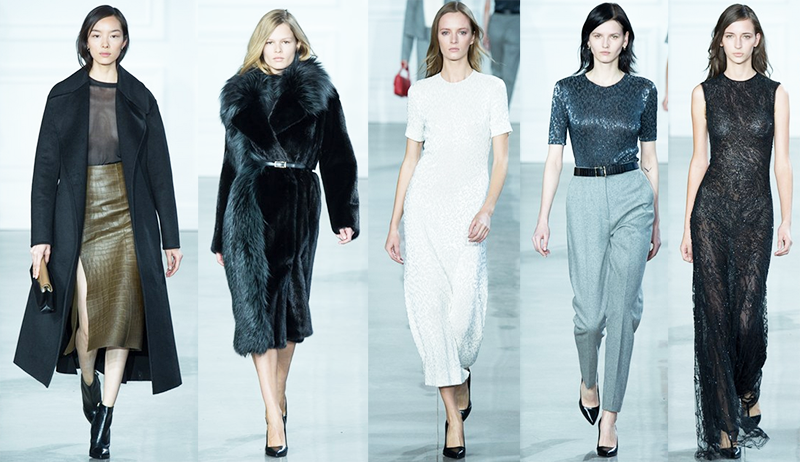 What I absolutely love about Jason Wu's most recent collection is the mixture of textures and the icy colours contrasted with dark tones. My favourite look is the first one, because I love the way that Wu has mixed the transparent fabric of the top with the heaviness of the coat and skirt. The silhouettes also add an ease to his clothing, which works brilliantly in the final dress as the way the fabric wraps around her body just looks effortless. Created in 1988 by Mark Badgley and James Mischka, Badgley Mischka who specialise in creating glamourous, stylish and wearable evening wear. Mischka describes their style as 'simple, streamlined and thoroughly elegant' with it harking back to the 'glamorous Hollywood of the Forties'. 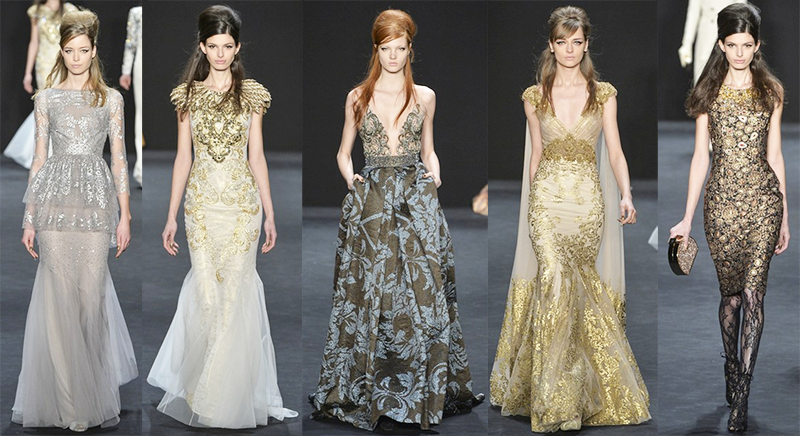 The dresses from Badgley Mischka look like they've just fallen out of a fairytale, that's how magical they are. Personally my favourite is the first one as I love how elegant and understated the silhouette is with the pretty silver embellishment. In particular I love the regal feel of this collection and how powerful both the second and fourth looks are with out being too overpowering. 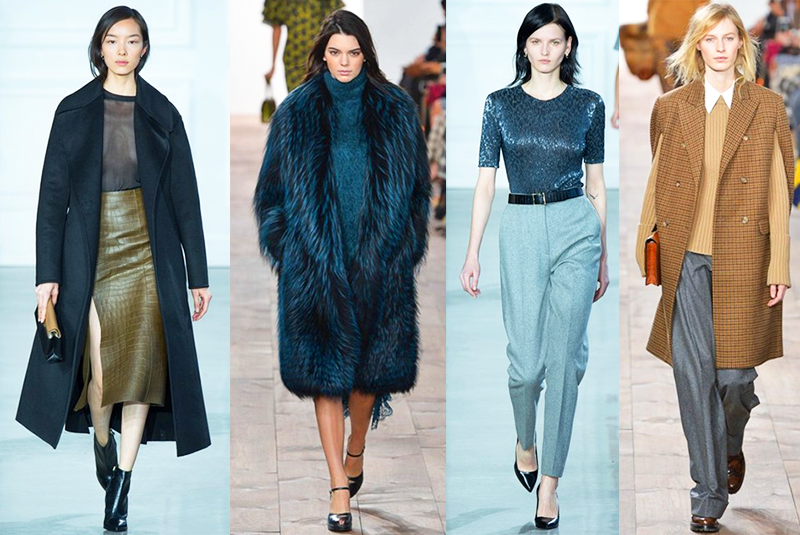 Michael Kors was established all the way back in 1981, and specialises in timeless chic and glamour. The man behind the collection, Michael Kors had talent from a young age and designed his mother's wedding dress at five years old, yes really, five years old. He's also known for being a judge on Project Runway (one of my favourite shows ever by the way) for several years. 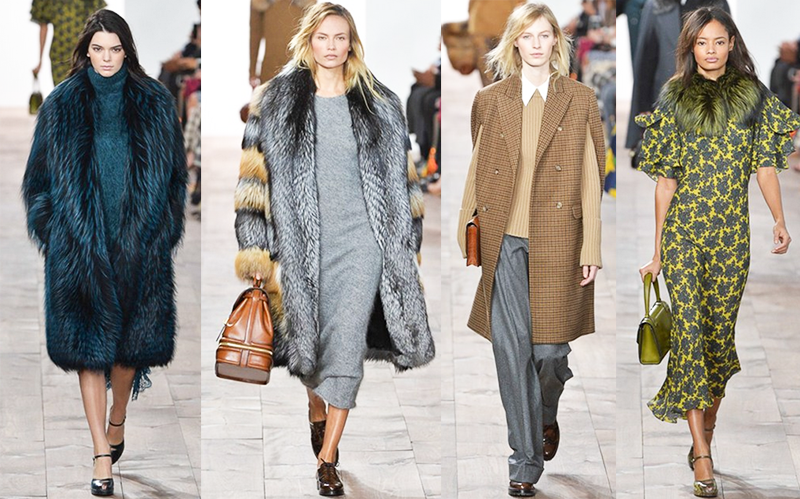 Michael Kors's real strength in this collection is his layering and mix of accessories. I love the androgynous feel of his third look and the illusion of it being a proper coat but actually being sleeveless. I also love these giant fur coats, especially the dark green one in the first photo - which I secretly hope is faux because I would never want to wear a real fur coat! Marchesa is a fashion house that has been around since 2004, and was founded by Georgina Chapman and Keren Criag and are known for their elegant and glamorous evening wear. The brand is named after socialite Marchesa Luisa Casati who was famous for eccentric style. 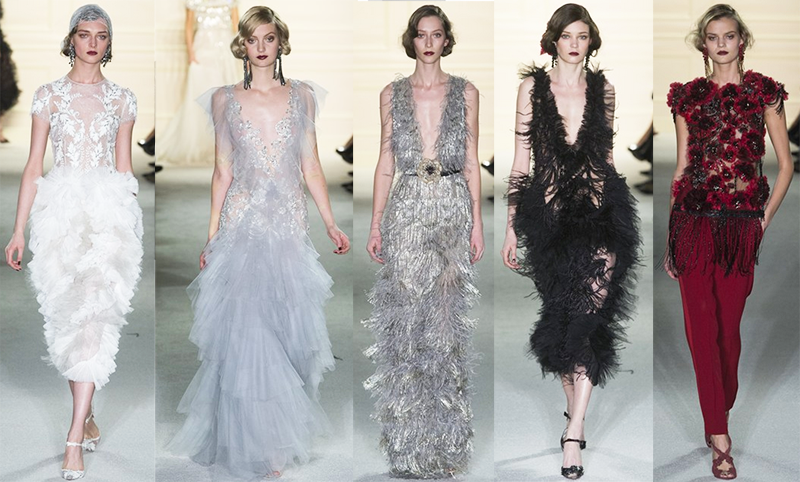 Marchesa's latest collection oozes Hollywood Glamour and has a very 'Downton Abbey' vibe, you'll know what I mean if you watch the show. Throughout the collection are poppies, fringe and feathers which really bring a touch of romance to their outfits. My favourite dresess have to be the first two. I love the balance of the delicate leaf detail on the bust of the first dress with the puffy elegant skirt. The second dress just looks so effortless and is fitted to absolute perfection. Vielma London, is a fashion house created by Chile born Gabriel Vielma in 2012. Gabriel designs for strong confident women and their clothes are characterised by bold prints, luxurious fabric and clean cut design. Admittedly I'd never heard of Vielma before I decided to do this post, but I was struck by how fierce and strong their clothes are. I love the boldness of the final dress, with its strong silhouette juxtaposed with its thin mesh like fabric. My other favourite piece is the first coat as I love all the details on it, including the cool placement of the zip. Thank you for reading lovelies! Have a wonderful Saturday, and let me know in the comment section below what your favourite looks are - and if you'd like to see more posts like this. I'm crazy about so many of these! Gotta love McQueen! Yeah, I always love practically anything McQueen put out! Alexander Mcqueen always just nails it ! Marchesca looks like The Great Gatsby gone rebel. Just so beautiful and so exotic! Haha that's a great way of describing it - I love that it's slightly edgy but feminine at the same time! Love Kendall Jenner's look. Great post you put together, its really hard to pick a fav! Me too - and thank you!